With a range of contemporary cuisines, comfortable atmosphere and the utmost in flexibility. 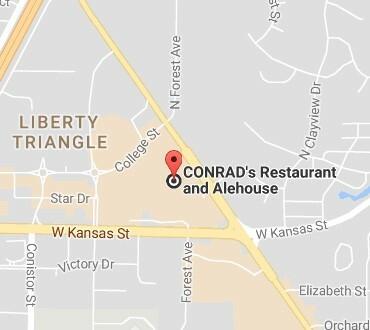 CONRAD’S is the perfect place for your rehearsal dinner, company event or private party. Featuring a private dining room with seating up to 40 guests or the ability to host up to 100 guests for an hors d’oeuvre party, CONRAD’S can customize your special event. Choose from 3 menu packages or work directly with our Community Room Manager to tailor a menu to your exact specifications. As long as minimums are reached there will be no fee for room rental. Dates will be considered booked once the room contract has been signed and deposit equalling room minimum has been made. Please fill out the form and the email will be sent directly to our Special Events Manager.